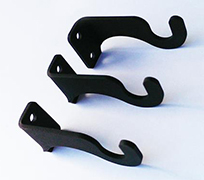 Our curtain rods include the brackets and center support pictured below at no additional cost. The brackets and center support measure approximately 2 5/8" D x 1 1/4" H x 3/4" W.
Our curtain rod with dragonfly finial is crafted from wrought iron and finished with a baked-on powder coating, which not only provides a smooth satin matte finish, but provides maximum protection for indoor and outdoor use. The rods are approximately 1/2" diameter between finials. *Related items are shown at a discounted price at the bottom of this page. Due to limited space additional items are shown on the shopping cart page. This American made wrought iron curtain / drapery rod is handcrafted in Fabius, New York, by Village Wrought Iron.